The pink area is granite and related rocks of the Montara Mountain block, which I showed you in August. Those rocks are something like 80 million years old. 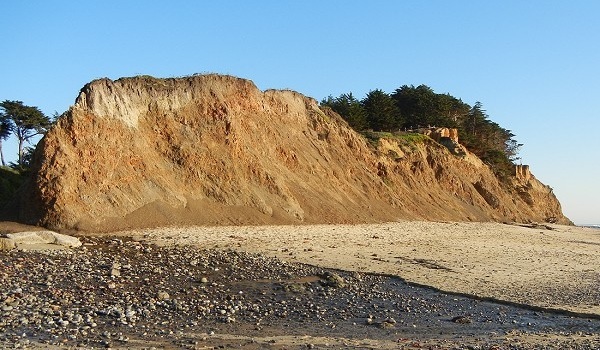 The ridge between Pillar Point and the town of Moss Beach is made of something else, though: the much younger Purisima Formation, shown in beige. 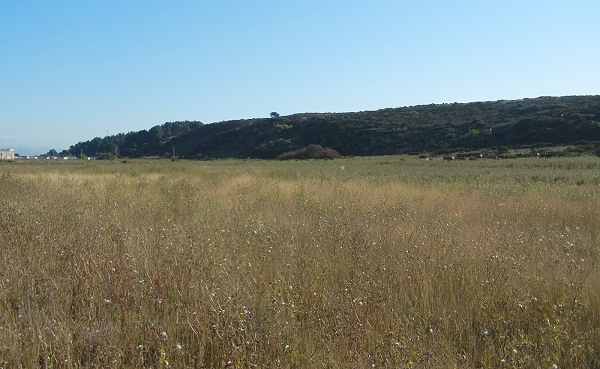 Between them is a thick black line denoting a good exposure of the San Gregorio fault, which we saw a few months ago at its other end, at Point Año Nuevo. 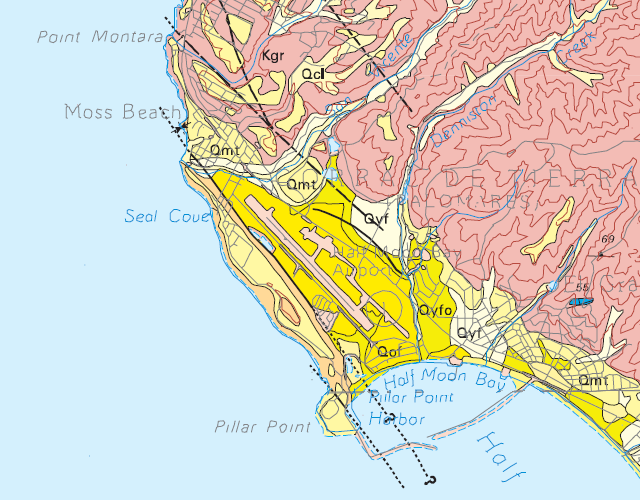 The units labeled “Q” are geologically recent sediments and not rocks at allQmt represents marine terraces like those at Point Año Nuevo and elsewhere. 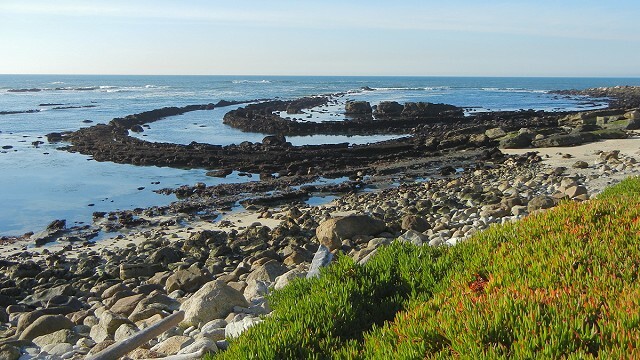 The coastline here and parts of the ridge are part of the Fitzgerald Marine Reserve, a county park with a dedicated group of supporters at fitzgeraldreserve.org. When you visit, leave your rock hammer at home. Oh, and check the tides first, too. 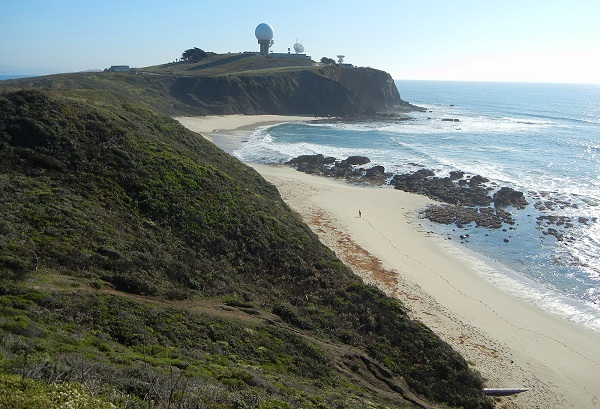 At the reserve’s south end is a trail leading over the ridge to the beach. Here we get our first look at the extensive wave-cut platform, exposed at low tides, that makes Fitzgerald such a destination for tidepoolers as well as surfing fans. 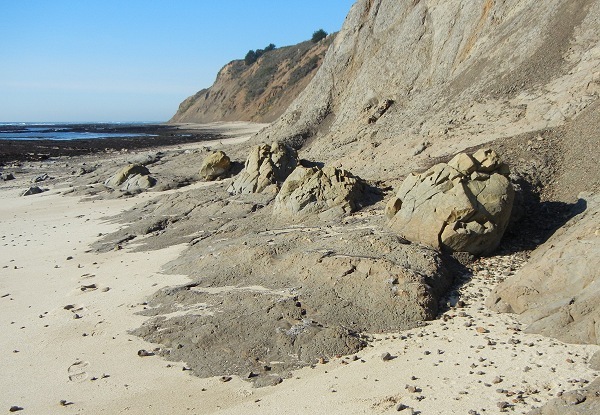 The cliffs here are a good place to become acquainted with the Purisima Formation, a mixture of shale and mudstone with occasional large concretions along certain bedding planes. You can find a few fossils here if you look carefully, but there are better places farther along. 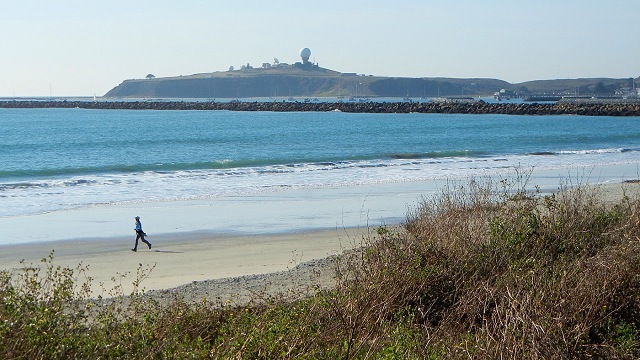 The middle portion of the Fitzgerald Reserve is on the east side of the ridge facing the Half Moon Bay airport. From Airport Road you can see where the San Gregorio fault runs along its base. 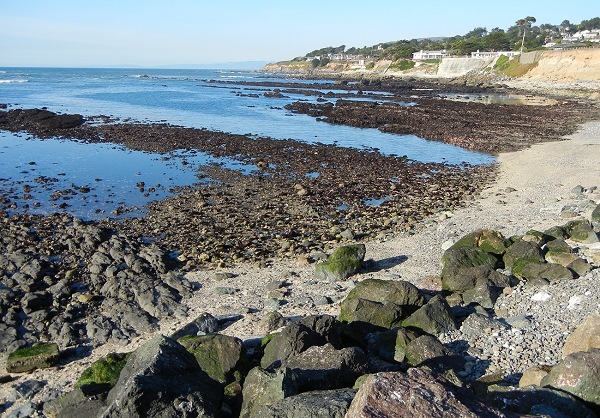 The north end of the reserve is where the tidepoolers all go. The fault comes out here, pointing straight at Stinson Beach in Marin County where it merges with the San Andreas fault. Before you go out on the rocks, turn around and look at the east side of the entrance, which is typical marine terrace sand. Then go to the west side and see the contrast presented by the Purisima Formation. 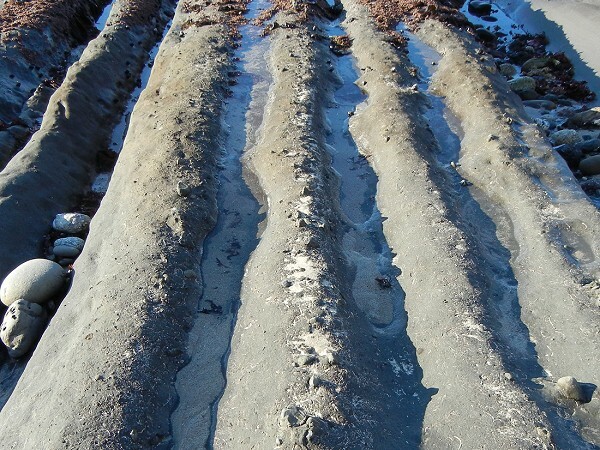 The Purisima in the tidepools is sanded by the surf to bring out its tilted bedding layers, which are punctuated by layers of dropstones and shell hash. Shell hash is pretty much what it sounds like, a layer rich in shell fragments. Farther along the north side of the beach, the rocks turn rapidly into coarse granite conglomerate, some layers containing outright boulders. 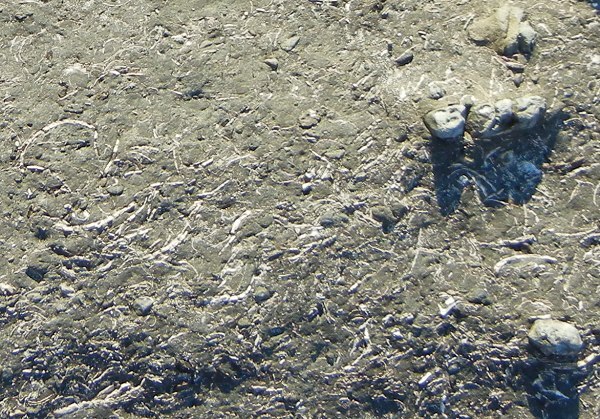 It was an extremely vigorous environment that produced rocks like thisperhaps a high sea level and large landslides produced by major earthquakes. Perhaps something like Devils Slide today. But at some point, be sure and climb to a higher vantage point to see why every geology class in the Bay Area comes here to practice mapping. It is a magnificant syncline, or folded trough, where fault motion has bent the rock layers and the sea has planed them off into this dramatic arc. “dropstones” is the wrong term here – those are just pebbles, not ice rafted. 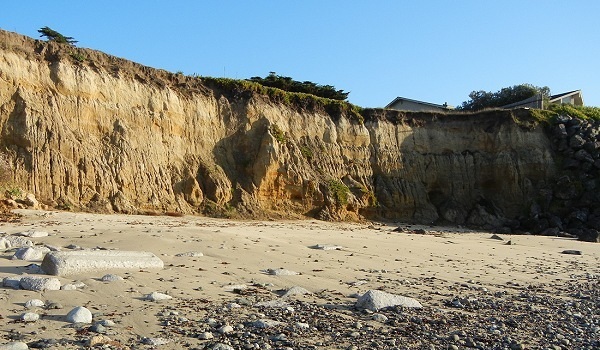 And hey – you didn’t show a photo of where the San Gregorio Fault goes right under a clifftop mansion (pity they had to prop it up with all that riprap, no exposure of the fault core on land). But at low low tide, you can get into the gouge zone and grab handfuls of nearly pure smectite along the western limb of the syncline. Thanks, Christie. The tide wasn’t super-low when I visited, but it will be during Thanksgiving week. I say “dropstones” as a shorthand for big cobbles sitting isolated in a mud matrix. The term does not mean glacial dropstones; “glacial dropstones” means that. 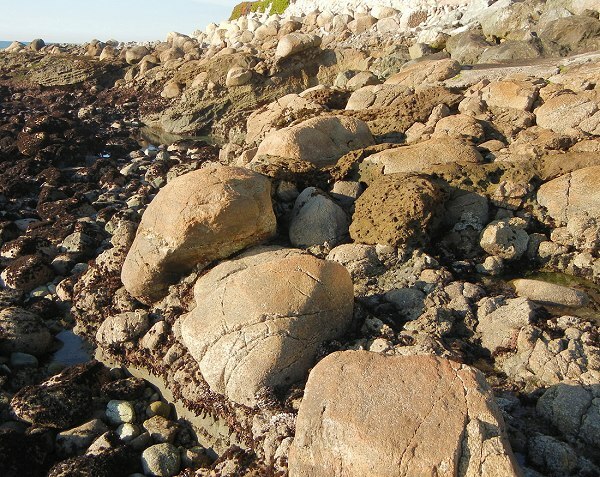 They are more likely tree-root or kelp-holdfast dropstones; or some other mechanism put them there, like sea otters.